Little Cigars - Enjoy cigar brands including Captain Black Little Cigars, Swisher Sweets, Racer, Cheyenne. Dreams, Santa Fe and Winchester Little Cigars. Little Cigars smoke more like a cigarette. They are filtered, slightly larger in size and classified as a cigar. 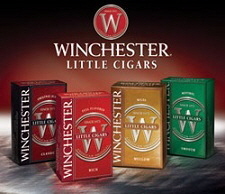 In 1971, R J Reynolds® introduced Winchester Little Cigars and the market for this product boomed. Reasons why little cigars have grown in popularity are their lower price and quality that consumers enjoy. Many smokers have made little cigars their brand of choice.